October 31, 2010  Sunday is President Obama's last day on the road before Tuesday's midterm elections. His get-out-the-vote effort took him to Pennsylvania, Connecticut and Illinois on Saturday. On Sunday, he'll fire up the base at one last big rally in Ohio. October 29, 2010  On the campaign trail lately, President Obama has been saying he expects more bipartisanship after this year's election. That has some veteran political observers wondering where that belief comes from. They see compromise as less likely, not more, after Tuesday's vote. October 23, 2010  President Barack Obama wraps up his big West Coast campaign swing today. NPR White House correspondent Ari Shapiro brings us the highlights, including Friday's big rally in Las Vegas for Senate Majority Leader Harry Reid. October 21, 2010  The president is spending Thursday in Seattle talking with women about the economy. The campaign stop is an effort to convey to women that in these tough economic times -- among their jobs, schoolwork, parenting and other duties -- going to the polls has to be a priority, too. 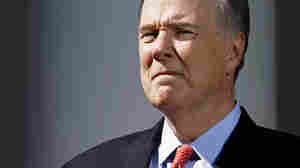 October 20, 2010  Tom Donilon will officially assume the role of national security adviser to President Obama next week. The promotion will be a rare emergence into the spotlight for a man who has spent decades as an influential player behind the scenes. October 11, 2010  In the last three weeks before midterm elections, President Obama is trying to close the enthusiasm gap between Republicans and Democrats. That means mobilizing young and minority voters. Those groups are more likely to support Democrats and less likely to vote in midterms. On Sunday, Obama staged a rally in Philadelphia. October 9, 2010  The latest unemployment report shows the jobless rate is basically stuck where it's been, which is to say, the situation is not good. The private sector added fewer jobs than economists expected, and government jobs disappeared. This is the final jobs report before November's midterm elections, and elected officials are figuring out how to deal with it. October 8, 2010  When new monthly unemployment numbers come out Friday, the chair of President Obama's Council of Economic Advisers will be on all the TV networks talking about the figures. For the first time, that person will be Austan Goolsbee. October 7, 2010  The federal commission investigating the spill said that by underestimating how much was gushing -- and, later, how much oil remained -- in the Gulf of Mexico, the Obama administration "created the impression that it was either not fully competent to handle the spill or not fully candid with the American people." October 1, 2010  President Obama's chief of staff Rahm Emanuel is stepping down, and the president's senior adviser, Pete Rouse, is stepping into the role until a permanent replacement is named. 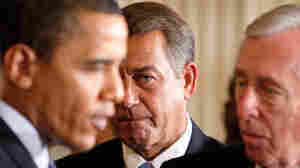 The resignation has been expected for days, but Obama made it official Friday with an announcement at the White House. Naming the replacement could have implications for the upcoming midterm elections. September 30, 2010  Intelligence reports suggest terrorists have been plotting to hit targets in Europe, including perhaps in the United Kingdom, Germany and France. The challenge for officials is to determine what the plot actually is and how to head it off. September 29, 2010  The Supreme Court's newest justice will be participating in fewer cases than most new justices. That's because prior to Elena Kagan's appointment, she served as the government's chief advocate in the Supreme Court. As a result, she already has recused herself from more than 20 cases. September 24, 2010  The White House granted many Democrats' wish this week, announcing that first lady Michelle Obama will campaign for midterm candidates. Her first fundraiser is in mid-October, but, in the meantime, she's doing events that are a bit more light and breezy. September 22, 2010  From Day 1, President Obama has tried to keep his sights trained on jobs and the economy, but foreign affairs intrude again and again. This week, mandatory appearances at the United Nations General Assembly distract the president and his message.